"Overall we enjoyed our stay." 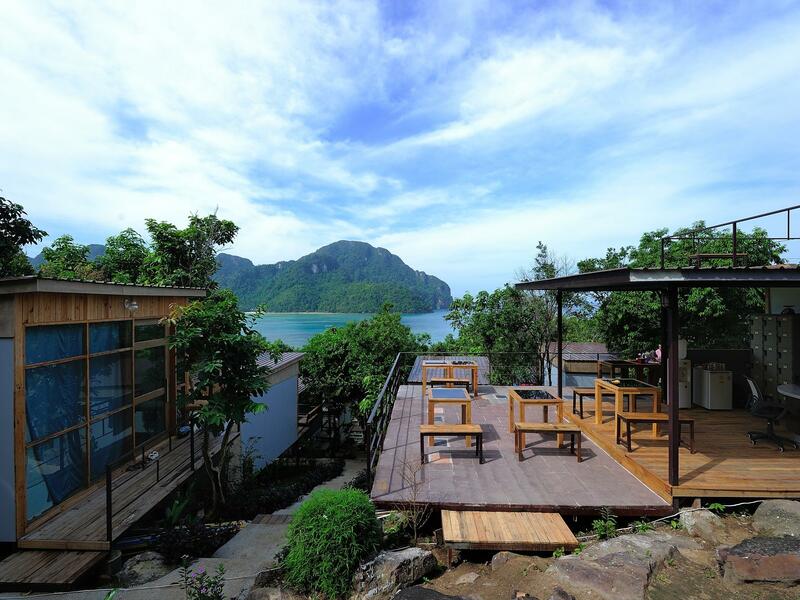 Have a question for Phi Phi Sea Sky Resort? "The view is amazing, they even have their own view point on the roof." "The rest of the staff were AMAZING." "The employees are very kind and its ont of the only hotels that come pick you up for FREE at the pier and bring you back when you leave Phi Phi." "Great hotel, helpfull staff, great view with perfect sunset..."
Nestled on the hillside, Phi Phi Sea Sky Resort is a fascinating and modern Thai resort. This elegant resort offers a perfect backdrop for the travelers who are in search of an exclusive and relaxing holiday. 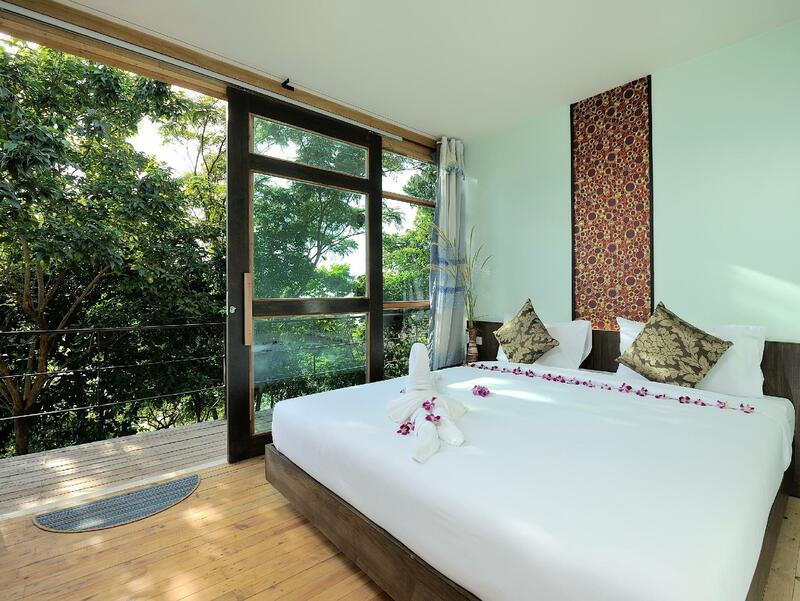 Known for its high standard and hospitality, this modern accommodation features elegant, yet traditional, Thai guestrooms with either garden or sea views. The resort provides wooden cottage accommodations, each offering a private balcony, air conditioning, satellite TV, and a refrigerator. The comforts of a personal safe and hot water showers are also available. The resort offers an excellent variety of recreational facilities including a garden, massage parlor, and snorkeling. Exciting day trips to neighboring islands can be arranged at the tour desk. Enjoy true relaxation at Phi Phi Sea Sky Resort. "Great, clean place with simple rooms." Property staff will stand by to pick up at Ton Sai Pier by showing property sign. Cant beat the view for the price. There'a a 10 minute walk to go to the main village but its still worth it, a few steps to walk also. I would not do the up and down 5 times a day. The employees are very kind and its ont of the only hotels that come pick you up for FREE at the pier and bring you back when you leave Phi Phi. Amazing spot, i would go again ANYTIME. Great place with fantastic views & very peaceful location except at night when you may struggle between 10:00pm & 2:00am - along with approximately 50% of the island - with what is essentially noise pollution from the 5 or 6 party bars at the end of the main beach. We stayed here for 4 nights in November. Overall we enjoyed our stay. The view from our room was amazing but the reviews about the long walk to the hotel are no joke. The walk took about 15 minutes at a good pace and there are certain areas of the path that are very steep. I'd recommend bringing a flashlight for the walk back at night time. The staff picked us up from the port and helped carry our bags to the hotel. If the tide is high they will bring you by boat but if you arrive at certain times of the day the tide is too low for this to be possible. The previous reviews about the receptionist are completely accurate. She really is rude. The rest of the staff were AMAZING. Very friendly and willing to help with any questions we had. The room was clean - there were some ants but we had our room cleaned daily and they were gone after. I'm sure they spray for bugs when they clean which we appreciated. Other than the view from our little cabin thing, everything was pretty awful. The room was messy, the bed was infested with ants it was disgusting! The doors had large gaps between the frame and the actual door when it was closed, allowing any type of creature to crawl into your room. The shower was stuck on cold. Overall not a pleasant experience. We have 2 couple in here 2 days. The hotel located so far boat station. You just walk only in the island. The staff of hotels will welcome you at the harbour and help you bring ur laggage. But it it not happend after you check out. The room is not clean, bathroom is so horrible if you come here for romantic trip! If hiking is ur daily activity then a walk upthe hill to ur room sure fits ur dailyquote. Thus its an outdoor hut room alot of ants flies and etc is around to accompany. aircon is prettyhotduringthe day.. 50/50 for me to book nexttime.. The view from the property was great, but one step towards 4 or 5 stars could be appreciated here. My guest and I walked on a path into a golden orb spider and her nest in the morning, and had geckos in our room. Although that was all a little nerve racking, the facilities are clean and the staff is great. They meet you at the pier and boat you across the bay. The “garden view” rooms actually have the best view, being at the top of the property. We were happily dripping with sweat every time we got back to our room, know that it is a hike up stairs to get back. Access to main road/path is 5-8 min walk. Music is the biggest downfall for this property. Beautiful stay, too much bass and weird techno. Can’t sleep until 2am nightly. The hotel was nice, it had a fantastic view but of course if you want that view just know you need to be far away from town. It was not that bad it was only 10 minutes away walking. The price was fair but the staff was not that great specially the lady in the front desk. She didn’t have any manners and she was rude as you can be. We requested a double bed and we were given 2 singles beds. When we went to the front desk to make the claim she was extremely rude and took us to the new room in a really bad mood. She is giving the hotel such a bad image. That’s a shame because the hotel has a lot of potential. We stayed only 1 night but I have to give kudos to service and staff. From pick up at the pier, to allowing us to check-in on arrival (10.30 am) and letting us have breakfast on that 1st day, they were amazing! It allowed us to maximize our time at Phi Phi. The resort is in a more distant, but quiet and beautiful surroundings - depends what you're looking for. Prepare for walking to a steep hill. On the other hand, closer to popular viewpoint ;) The breakfast was very good, 3 options to choose + fruits, coffee and juices. Cons would be a bit outworn bed and older rooms (they look nicer on pictures than in reality), but for short stay/sleeping only it was ok.
Amazingggg view! We really enjoyed it! It is a bit of a walk (10min) up a lot of stairs, BUT it a cool area you get to walk through that shows a lot of local living which was cool. Highly recommend purely based off of the view. Thanks! The room is about a 30 min walk from where the boat drops you off and is one of the most treacherous paths way I've ever walked. Luckily I didn't sleep in the room as I made friends else where but my friend who did was eaten alive by bed bugs. My other friends room was a haven for angry red ants that love to bite. Really let down by the staff who demanded another 2000 baht when I said I had left the key in a bar near by but didn't have time to drop it back. They were completely insensitive. The location was impossible to reach, if your slightly unhealthy or even a little physically afflicted don't bother. On top of that although the place looks lovely the bed was covered with bugs, a cruise operator confirmed they were bed bugs. Its disgusting this was supposed to be a treat at the end of the trip. Utterly disgusted and disappointed far below the expectations I had. The breakfast was limited and I would not stay there again. Even when I had advised the staff they hadn't changed the sheets. Stay elsewhere. Sadly all accommodation is overpriced on the island, this place is ok, clean, small, quite a hike to get to. We chose it because we thought it would be far enough away from the techno beats, sadly it wasn't. After 3 nights we moved to another quieter area which was actually closer to the centre and not so many hills. Had a lovely stay, the staff goes out of there way to make you feel home. The view is amazing, they even have their own view point on the roof. In my opinion better then the Islands view point. The rooms are Nice, especially because of the big glass wall. Ants in the room, But same as sand, you can not do anything About that on a island in the middle of the forest. Breakfast is Free and Nice. When you arrive and check out, their is a longtail boat to take you to the hotel and Back to the pier. Good extra service! The staff speaks limited english, But basic communication is fine and their are very friendly. Great hotel however the hotel is situated on a very steep hill, the lift system is VERY SLOW and for the last 2 days it was 'out of order' we were staying at the bottom of the resort so this made walking up the VERY steep stairs in the Heat very hard especially with heavy backpacks. If this lift is out of order when you stay then DO NOT STAY HERE everything else about the hotel was great.